So, I’d like to apologise right out for my inability as of late to keep up with my posts. I’m going to promise all of you loyal followers and passing stumblers that I’ll be on top of it from now on, despite my recent setbacks. But I also promised you two posts today to make up for my failure to deliver on Sunday, so I’m going to have to get started in order to keep enough inspired muses going to write two posts in one day! You may or may not be able to appreciate the work of Sarah Amos, but it’s worth a try for everyone. Hopefully, if you’ve been reading all of my art posts lately, you’ve developed or honed a keen eye to understanding art and perceiving the nuances between something powerful and something vague. 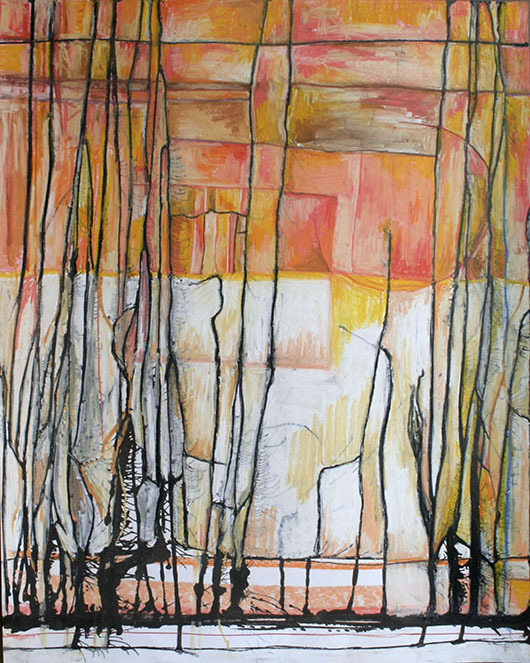 From the Philip Institute of Technology in 1987, to the Tamarind Institute in 2002, Sarah Amos has attended several programmes to develop her talent of printmaking. Now, I don’t talk about printmaking much because it’s not something that I practice, but it’s certainly an art that I can appreciate. Sarah Amos makes prints, usually very large ones, that reflect movement and complex overlapping through printing “ghosts,” which are the remnants of past prints. You can view more of her work that what I show here through her website (http://www.sarahamosstudio.com/index.html). But let’s start talking about art, shall we? I’m going to turn to the print I’ve displayed to the right. Like the header image, it contains muted tones and black lines, along with printing ghosts. But what makes Sarah Amos’ work come to life is its kinetic appeal. Quite frankly, it lifts you up and drags you from one corner to the next. The black loops, reminiscent of heart monitors, use detail and repetition to cloy you to the top of the page, then drop you sharply and sweep you along so that you begin to take in all of the information of the page, moving across the bottom line and up into the more subtle ghosts in the upper quadrants, with such ease and fluidity, it’s almost like visual swimming. Here’s another. The juxtaposition of the harsh horizontal scratching to the organised, monotonous, geometric vertical drop gives this piece a feel that is distinctly like a vector. It’s mathematical, yet complicated. However, it’s not done with a compass or a computer; we can see, as on the far lower left, how there is an organic nature to even the rigidly organised. This subtle difference from true structure allows our eyes to feel more relaxed when viewing the image, and more interested in the dropping lines. We don’t just bunch them into “vertical stripes.” Suddenly, they’re sweeping lines that careen off of the upper mess, rather than a thin barcode that is simply seen as one unit. For the last piece I look at, I’m going to choose one that’s very similar to the first etching I showed you, but didn’t get a chance to discuss. This complex, overlapping system of lines also provokes optical movement in a slightly different way than the others we’ve looked at. It seems to spiral out of the centre of the page, an illusion occurring both because of the dark, prison-stripe lines being neither parallel nor perpendicular to the sides of the page, and also to the immense amount of subtle lines in the background. These lighter lines, which we don’t immediately perceive because of their proximity in value to the base colour, twist from a slight incline in the upper left, to a sharp incline in the lower left. This, along with the organic, transforming quality of the prison-stripe lines, gives us the sense of movement that Sarah Amos so masterfully creates with such simple art. So you all know that we, over here on Taxidermy and the 20th Century, love things oldey-timey. But we don’t just love the unusal ancient things and spend all of our time poring over old books and old things and old stuff. Sometimes, we like to see how the ancient and the traditional merges with the modern, and that’s how I give you Kehinde Wiley. Wiley likes the same things that we do here at Taxi20: the old and the new. However, he takes it a step further. He gives people of black heritage, specifically those with an African American culture, the same sort of traditional paintings that white people have had throughout their history. I mean, anyone who has studied Art History or European History (or perhaps even World History) can recognise the painting to my left. It’s Napoleon crossing the Alps to lead his French soldiers into battle against the other empires of Europe. It’s a painting that clamours of glory and pride, and Kehinde Wiley repaints it with a major change; we see that a camo-donned African American has taken the place of Napoleon. Suddenly, Kehinde Wiley has placed a member of his own race as the leader of national pride and liberty. By mixing these two different ideas of black culture and classical portraiture, Wiley brings the gift of classical pride to blacks. He’s shouting that his culture and heritage is something to be proud of! Wiley doesn’t just paint African Americans, though. He paints also Afro-Brazilians, Ethiopian Jews, and a whole slew of other varieties of people with black heritage. We live in a modern world that is both teeming with racism and adamant that the issue is one of the past, not of today. But as retroverts and antiquophiles (two new words I have made up), the bloggers here at Taxi20 can tell you that the past and the present are deeply intertwined. It’s motions like this, where black culture is given the same pride and status as classical white culture, that help to blur the boundaries that exist in society today. So many of you have been following us through our exploration of art, cooking, theatre, crafts, oddities, and all sorts of interesting things. Since I know that quite a few of our followers appreciate art, I’d like to show you some of my own today! These are all pieces of various sizes and mediums that I have done over the past two years. I’ll upload a few and give a brief description of the piece, as well as any interesting things I can remember about making them. 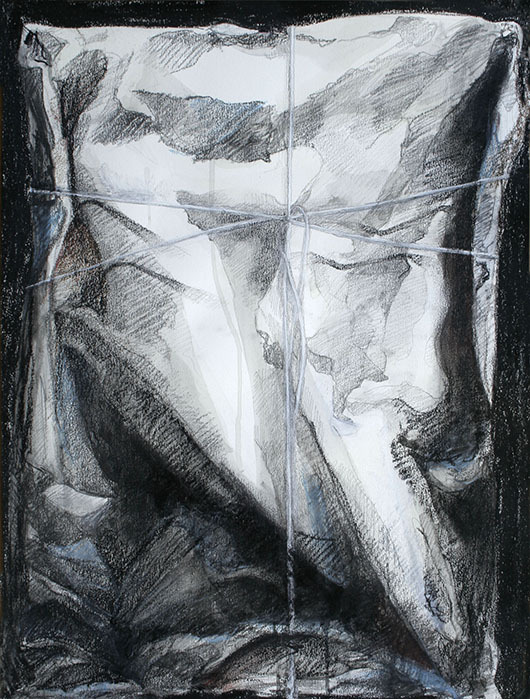 This piece is a depiction of a picture frame wrapped in white paper and tied with white string. It’s about 24×18″ and completely mixed media. As it was an exam, I had 4 hours to do this piece. Some of my materials include black pastel, charcoal powder, conte, pencil, ink wash, and coloured pencil. Clearly, I deeply exaggerated the forms to make the painting as dramatic as possible, rather than the subtle, understated forms that my peers attempted. I’m particularly fond of the deep gouges in the lower left quadrant. It seems almost violent. This next piece, more abstract in nature, was made with soft pastels and ink. It is approx. 30×24″ in measurement, and took me about 8 hours. I’m fond of the ghost shapes of ink drippings and splatterings behind the pastels, along with the various ghostly shapes that occur, such as the semicircle in the upper right hand quadrant. This was one of my first explorations of abstract art. To come to this piece, I did over 200 smaller pieces with less detail, which are now stacked up in my studio. Such a mess! I adore abstract art, despite having a background in more classical oil painting. The sheer emotion, unadulterated by simple realistic depiction. However, I’d like to introduce you to a few of my more classically influenced places. 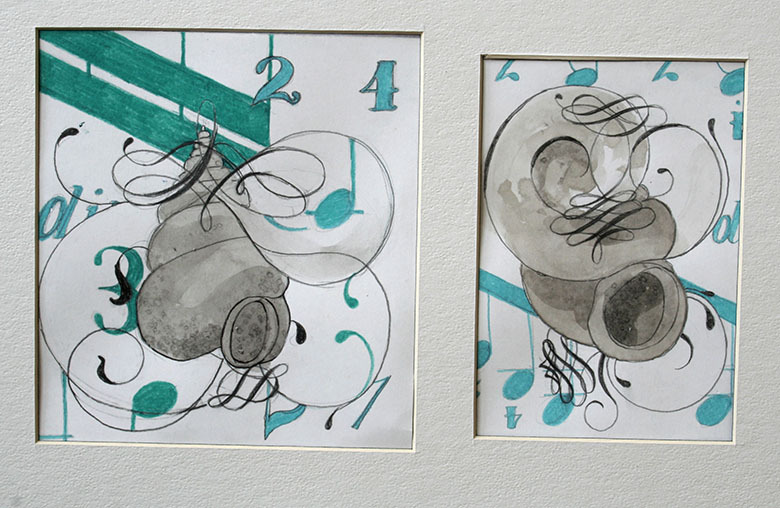 These pieces are relatively small, about 6×12″, and made of watercolour, coloured pencil, pencil, and salt. Starting with calligraphic marks, I then began to combine the calligraphic marks with the mollusks. Yay, mollusks! 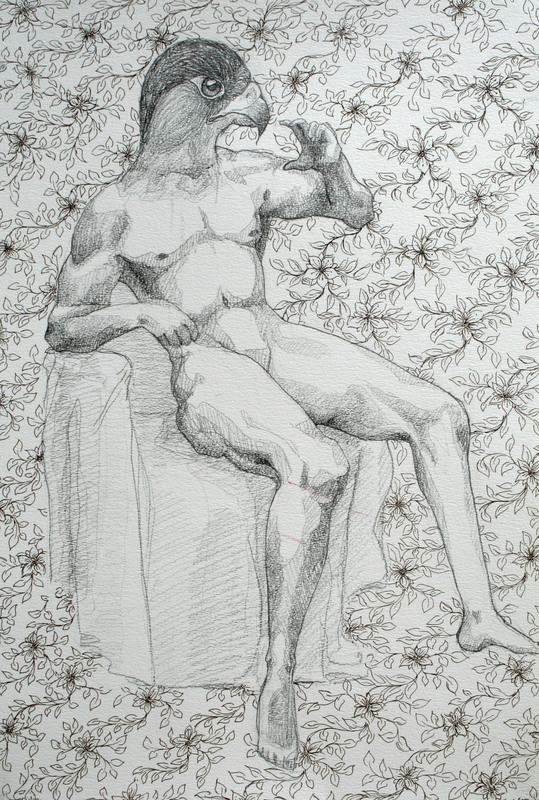 This piece is particularly large, about 18×12″ and made of pencil and pen. I did a whole series of human-animal composite images on dense patterns, and while this was one of my earliest, it is also one of my favourites. The awkward, unorthodox combination of the classical figure drawing, surreal dense pattern, and what I like to consider to be relatively realistic animal heads always gets me interesting reactions! I hope you enjoyed seeing my artwork rather than seeing someone you already know! Cheers. I know I seem to have gotten into an art rut, but I can’t help but want to share all of my favourites with you guys. 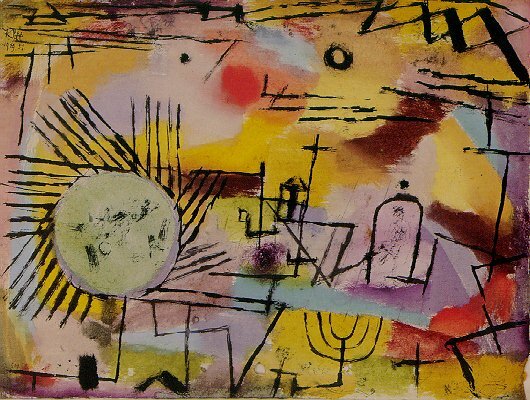 Today, I’m bringing you Paul Klee, a Swiss painter influential in the works of expressionism, cubism, and surrealism. He lived until 1940 and helped to draft and perfect colour theory, or, more colloquially, the ways in which we match colours to be aesthetic. Let’s peer into Klee’s world, shall we? Let me tell you, it’s a dark world. Much of his work is unnerving at best and disturbing at worst. I’ll open by focusing on his interest in colour theory, as depicted in the image above. The subtle use of rich warm tones and stark cold tones gives the piece a distinctly balanced quality. Yet it doesn’t feel polarised, despite the great difference between the rich black and poignant bright tones. Instead, it feels illuminated. If you peer into the shadowed areas, such as in the lower right quadrant, there are warm squares that balance against the cool adjascent to them. Also, the combination of the geometric to the organic, hand-drawn feel allows movement in the painting that would otherwise be nonexistent. What I adore about the piece to the right is not only its balance of colour but also of composition. It certainly feels left-heavy, but it is also grounded what with that thick, bold red stripe on the floor of the painting. This gives it a strong base from which the more complex geometry of the left can grow. Also, the left side does not contain an upsetting amount of contrast; the simple red blocks are the only extreme statement in the piece. 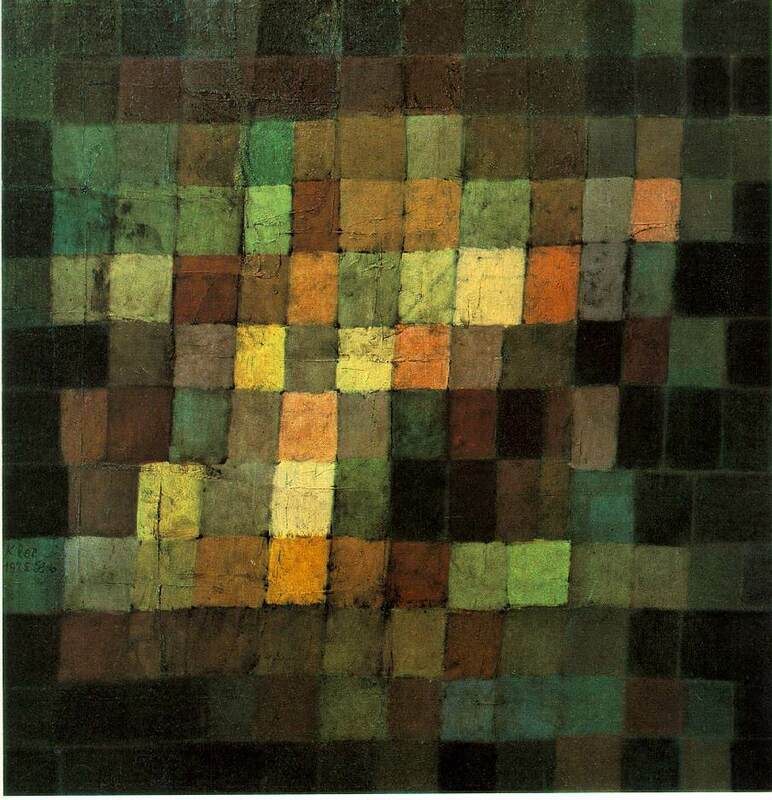 But Klee didn’t only work in squares, however. He could appreciate more than the stark geometric; some of his best works include the organic. Of course, because they are his best, they are also his most horrifying. Take Rising Sun for example (shown above). It contains plenty of organic shapes, such as eerie curves and clearly human-drawn circles. Even the geometric has a distinctly sketchy quality to it. But this is also what makes it deeply unnerving. The sickly combinations of colours hark Kandinsky, while the schitzophrenic black marks seem like a fragmented Motherwell. There is something upsetting about this painting, perhaps because it looks — feels like chaos. Klee was isolated for much of his artistic career, preferring to work alone rather than in the company of his fellow artists. He also had a consuming disease, which led to much suffering near his death. This piece, one of his last, is called Death and Fire. The “tod,” German for “death,” can be seen on the skull’s face. Starkly different from the careful, calculated colour swatches of his earlier work, there is something unnatural, burning, Hell-like, and tortured about this painting. The stark lines give us a severed feeling. The softness of them tell us how it must feel to burn to death from illness. What you are seeing now is a sculpture of an artist who tried to recreate a moment that existed for merely an instant. 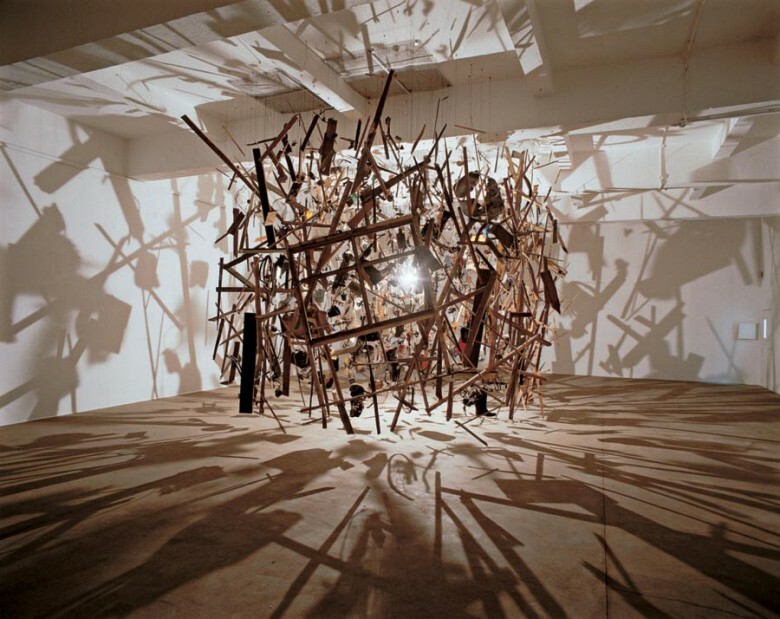 This instant can never be truly recreated, of course, but Cornelia Parker sure as hell will try. She prides herself in archiving the unusual, the overlooked, the moment when everything is in movement and we, as humans, cannot perceive all of the stimulus in the moment. She plays with shadows and tries to make movement in things that are still so that we can stop and admire a moment that we couldn’t before. 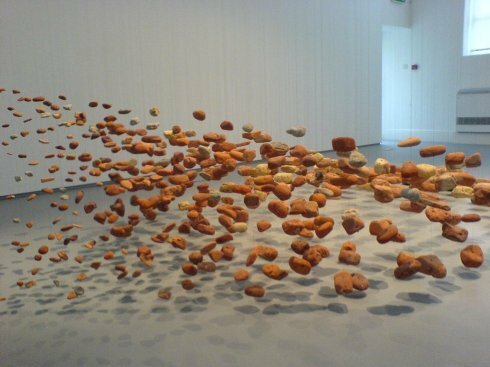 A British sculptor, Cornelia Parker lives and works in London on continually installing her unorthodox artwork. I was first put onto her trail by a friend, and now I just can’t get enough. Parker suspends items, often burnt wood or stone, with fishing wire. If you take a gander at the piece to the left, you can see the way in which it almost feels like it is fragmenting before your very eyes. To see them in person is even more unnerving. Suddenly, it seems as if time has stopped, and you are simply observing this for a moment before it continues on. She hosted an installation recently at the ICA in Boston, where my friend stumbled across her works. What a great discovery! She doesn’t only work with wood, but I feel so drawn to her pieces that are wood! Let’s take a peek at a few that also demonstrate what she captures without being simply a burnt shed, shall we? She struggles with the volatile and unusual. A rockslide in motion? Not too difficult for this sculptor. What is truly inspiring about her installations is to walk around them and perceive them from every angle. New things pop out to you at every turn! Everything hangs in suspension. It truly is an eerie, awe-inspiring sight and experience and I encourage anyone who can to endorse her work and try to visit when an installation comes to your area. In conclusion, I’d like to stop and think about for a moment what makes art so wonderful. Our modern perception of art, full of controversies and hypocrisies, often frustrates me. How much I long to return to the times of aesthetic impressionism or glorious realism! But then I turn to de Kooning, to Wilde, to all sorts of 20th and 21st century painters who I enjoy and I can’t help but be grateful that I live in an era when I can appreciate whatever sort of art I’d like!